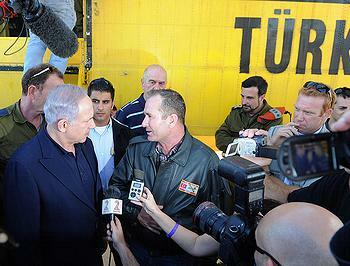 HAIFA, Israel, December 6, 2010 (ENS) – The fires on Mt. Carmel near Haifa in northern Israel have been extinguished as of Sunday night. Israel’s worst-ever forest fire started Thursday in a neglected trash heap and spread quickly across tinder-dry forestland on Mt. Carmel. Nearly five million trees on 10,000 acres were burned; experts say the forests will take years to recover. Fanned by strong winds, the initial blaze became a complex of dozens of fires that destroyed 250 homes, and caused over NIS 200 million (US$55 million) in damage, according to initial estimates. There were 42 casualties, mostly Israel Prison Service officer cadets who were on their way to rescue prisoners in Damon Prison when their bus was engulfed by flames on Thursday. All the casualties will be buried with full honors in military ceremonies. 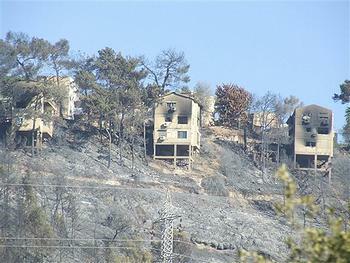 At least 17,000 people were evacuated from their homes. Israel mobilized thousands of soldiers, hundreds of vehicles, dozens of engineering machines and military firefighter vehicles. With the help of aircraft and firefighters from a dozen countries, Israel Air Force, Israel Defense ground forces and Israel Police began to gain control of the fires on Saturday. The Israeli government chartered a U.S. 747 supertanker from a private company that began dumping water and chemicals on the flames on Saturday. The U.S. government transported nearly 70 metric tonnes of fire suppressant and 3,800 gallons of fire retardant concentrate to Israel, which arrived on Saturday and Sunday. In addition, USAID Disaster Assistance Response Team, with fire management experts from the U.S. Forest Service, arrived in Haifa Sunday to help combat the blaze. “We are relieved to learn from the government of Israel that the fires are contained and commend them for leading and coordinating an extraordinary international effort to suppress the deadly wildfires,” Nancy Lindborg, USAID assistant administrator for democracy, conflict and humanitarian assistance, said Sunday. “The United States immediately mobilized when Israel needed our firefighting assistance, and we will continue to stand by our friends as they begin to recover and rebuild in the aftermath of the fires,” Lindborg said. As of Saturday evening, three firefighting helicopters, 12 firefighting planes and six transport helicopters from Greece, Bulgaria, Cypress, Britain, Turkey, France, Italy and Switzerland had arrived in Israel, including a giant IL76 plane from Russia capable of dumping 42 tons of water on a fire site in a single pass. 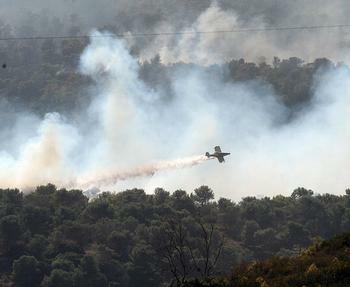 By Sunday, 35 firefighting planes were flying over areas that continued to burn. Major efforts were directed toward containing the fire in the Carmel Hai Bar nature reserve, and a breeding nucleus of raptors was transferred to the Ramat Hanadiv park, according to the Ministry of Environmental Protection. 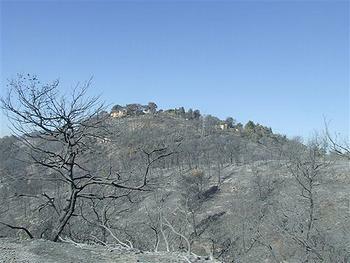 As firefighters brought the flames under control, the raptors were returned to the Carmel Hai Bar reserve. The animals in the reserve, which serves as a breeding core for the reintroduction of animals present in historical times but no longer found within modern Israel, were reported safe. The nonprofit Jewish National Fund says people in Israel and throughout the world have already launched a spontaneous initiative to rehabilitate the forests. “People have begun to donate funds for both future planting and for the extensive restoration work that will be necessary before planting can start,” said Yisrael Tauber, director of the Jewish National Fund’s Afforestation Department. But he said the organization will not rush to replant the scorched areas. Tauber said that because no vegetation will be present to stem the flow of water, his organization will prevent erosion in the burned woodlands by piling scorched tree stumps and branches along contour lines. Damaged trees that present a danger must be removed along with fallen trees downed by the bulldozers that cleared paths and created firebreaks to prevent the flames from spreading. Firebreaks must be created to prevent the spread of future fires, and, even more importantly, said Tauber, woodland must be thinned and burned vegetation removed. While unseasonal lack of rain was one of the reasons for the swift spread of the destructive fire, there is now a 20 to 30 percent chance of rain in the Haifa area, forecasters say.